I have managed to refrain from fabric purchases this week, but I have bought some parts for the 1908 Singer 27K that I am trying to restore. We named this machine “Cleo” for her Egyptian motif (Memphis) decals. I bought Cleo last November, and she was in a sad derelict state. She had been converted to electricity a long time ago but was no longer safe to use that way. 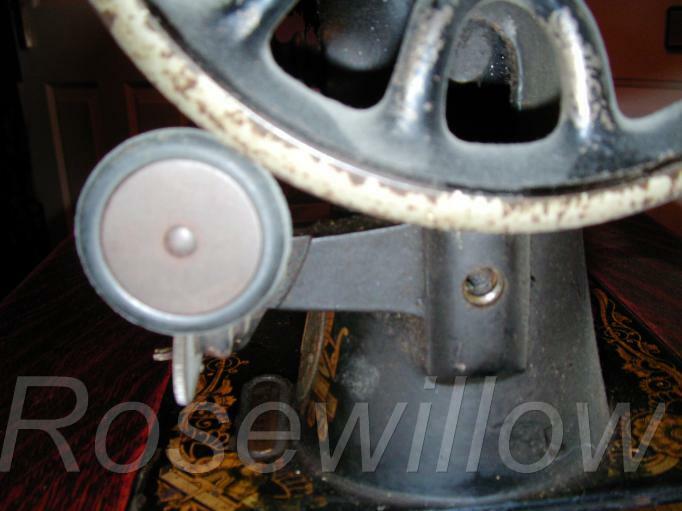 Her original treadle mechanism had also been removed from her table, leaving it very rickety and unstable. The good points were that her decals were in excellent condition and all the moving parts ran freely, and she cost less than my lunch in a sandwich shop! I don’t have room for another treadle machine, so I decided to try and restore her to good running order as a portable machine with a hand crank. Here she is today, after Part 1 of her transformation. I have removed the ugly white motor, and she is sitting in a 1950’s sewing machine base that has a hard case to protect her. I am hoping later to find a nice antique case for her. My sewing machine man was able to find me a hand crank for a 27K, and my husband put that on for me. It fixes with a bracket that is screwed in underneath the wheel. Now she is ready for cleaning and oiling! I think I’m very near to finishing a quilt top, so maybe next week I can finally show some real progress in my stash busting! 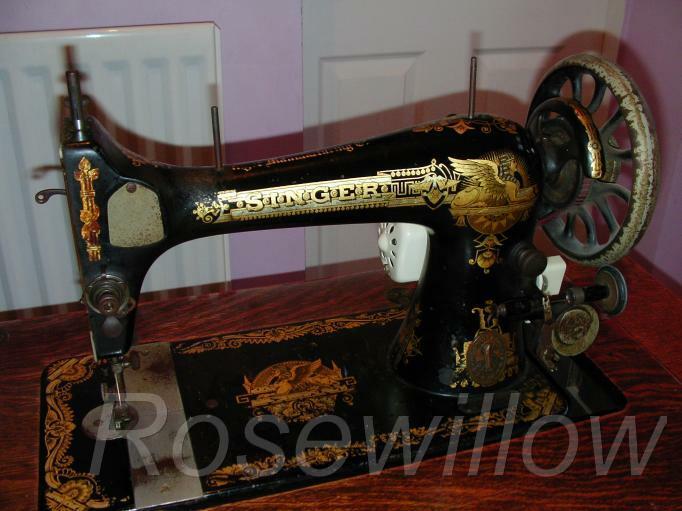 I didn’t buy any fabric this week, but I did buy another vintage Singer sewing machine. This one is a Model 27K, one of a group of 100,000 manufactured between January and June 1908, at the Kilbowie Factory in Clydebank, Scotland. 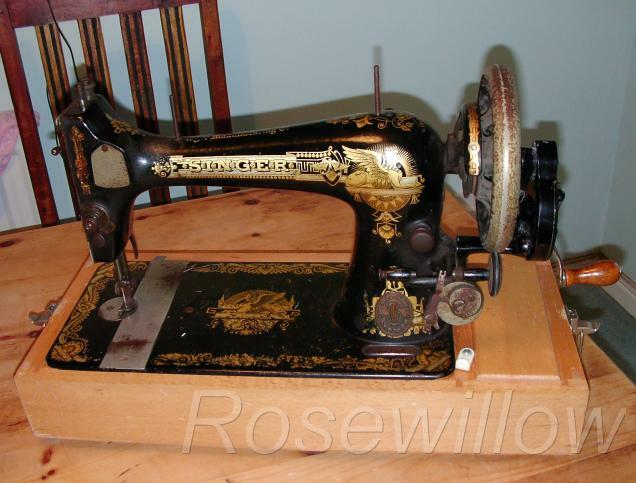 She used to be either a treadle or a hand-crank, but she’s been converted to electricity with a little white motor on the back. The electrics look a bit dodgy and the cord is frayed, so that will have to go. At the moment, the machine is sitting in a treadle table, but the cast iron treadle mechanism has been removed which causes the table to be rickety and unstable. I don’t think this was her original table, anyway — she doesn’t fit exactly right. The top opening is much too wide for her base, and on the interior of the cabinet, several notches and slots have been sawed into the wood to fit her shape when she is folded down. Luckily, her shuttle and several bobbins were included, along with a complete assortment of feet and attachments. She also has her original instruction book and both slide plates. My Stash Report totals this week are unchanged. Next week I need to get busy sewing if I’m going to make that 100 yard goal!